It is time to welcome back one of the most requested guests to the club. Brian Peters is a real powerhouse of traditional music and song. 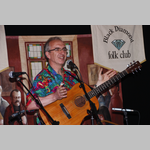 He is hailed as one of the finest ballad singers around, while his playing of melodeon, concertina and guitar will have your feet tapping and your hands clapping for more. Brian works frequently in the USA and can often be seen touring this country with some fine American folk artists.